As the cold creeps in, nothing beats defrosting over a delicious cup of coffee. Why not spice up your caffeine routine by indulging in something different? 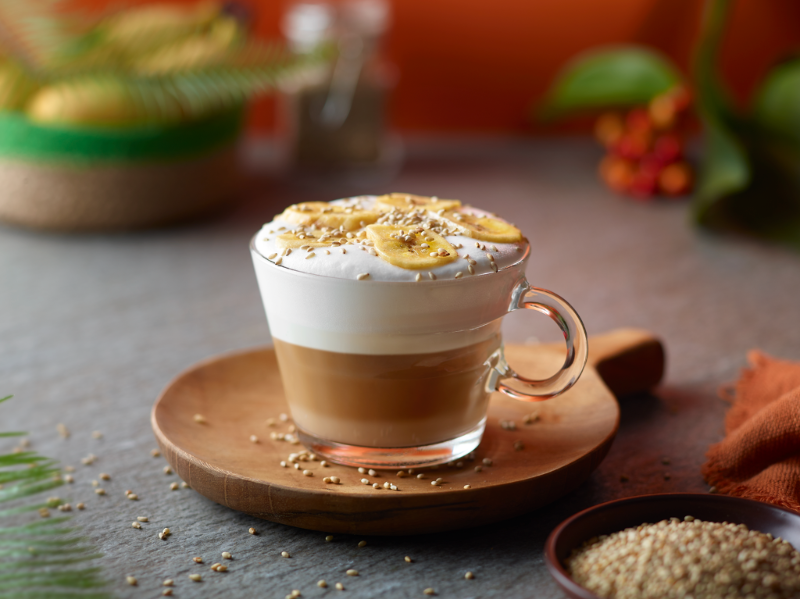 Just in time for winter, Nespresso has released a Limited Edition range of coffees hailing from the birthplaces of coffee: Arabica Ethiopia Harrar and Robusta Uganda. Pour the vanilla syrup into your glass. Grate lime zest and the dark chocolate into the bottom of the glass. Pour your Arabica Ethiopia Harrar Espresso over the ingredients. Froth the milk in an aeroccino or milk frother and top the milk froth on the Espresso shot. Decorate with lime zest and grated chocolate. Froth the milk in an aeroccino or milk frother. Mix the syrup with the froth and stir gently. Pour the froth into your glass. Pour your Arabica Ethiopia Harrar espresso into the glass. Place some banana dried chips on the top and garnish with sesame seeds. Arabica Ethiopia Harrar is a delicious espresso with notes of ripe fruits, fresh flowers that boasts a remarkably velvety body. Best enjoyed as an Espresso or a Lungo and has an intensity of 5. Add the syrup to the froth and stir gently. Pour your Robusta Uganda Espresso into the glass. Grate dark chilli chocolate on top. Garnish with a chilli pepper. Robusta Uganda is surprisingly sweet and undeniably intense, rich in cacao notes. Best enjoyed as an Espresso or Ristretto and has an intensity of 10. Arabica Ethiopia Harrar and Robusta Uganda will be available for a limited period from Nespresso Boutiques and Booths nationwide, as well as the new Booth at Mall of Africa, and through orders from the Nespresso Club on 0800 63 7773 or online at www.buynespresso.com.